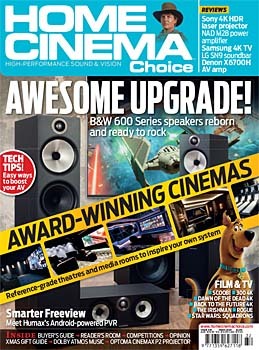 Since 1995 Home Cinema Choice has been the must-buy magazine for AV enthusiasts. Published thirteen times a year, each issue provides in-depth, detailed reviews of the hardware products on your shortlist – from hi-def/4K televisions and projectors to AV receivers, speakers, Blu-ray players, soundbars and more. We also travel the world seeking out the latest tech and trends, provide advice and inspiration for your own cinema project and reveal the Blu-rays and DVDs you'll want to add to your collection. I've worked on Home Cinema Choice for over a decade, and know that while the technology we cover is always evolving, one thing remains constant - the passion of our readers. And why wouldn't it? There's simply nothing better than having your own home cinema. Dim the lights, break out the popcorn and enjoy your favourite films with pristine picture quality and room–shaking sound, all without leaving the house.